Something old, something new, something borrowed and a lot of blues. This adaptation of the olde English wedding tradition nicely sums up what Rock and Roll Hall of Famer Steve Winwood and his fine band brought to the Count Basie Theatre in Red Bank New Jersey on October 7, 2006. Steve Winwood is back in the high life, and the spot light, again! Throughout his career Winwood has wed and weaved various styles of music that has resulted in a long-lasting and successful multi-platinum career. From the marriage of blues, folk and psychedelia that was Blind Faith and Traffic, to the more commercially-successful pop periods of the 80's, Winwood has endured and prospered. Steve Winwood began his career as a child musical prodigy. Adept at the Hammond B-3 Organ and guitar he was a part of backing bands for blues singers Muddy Waters, Howlin' Wolf, B. B. King, Chuck Berry, and Bo Diddley among others, when these artists toured the U.K. His experience and proficiency was undeniable and Winwood was soon asked to join the Spencer Davis Group at the age of 15. Thus would begin one of the most remarkable careers in rock and roll history that would include stints in Blind Faith, Traffic, before finally breaking through as a solo artist in 1981 with the release of the stellar and surging Arc Of A Diver. 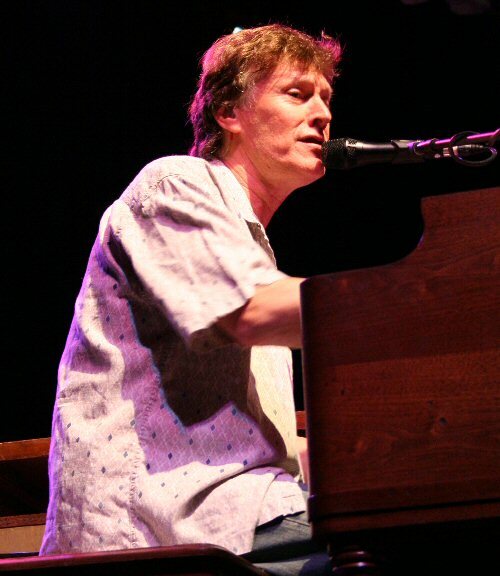 Reportedly on tour to "just get out and play" Steve Winwood was performing in support of two recent musical releases. 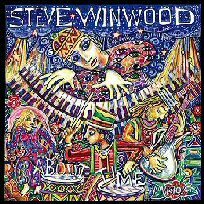 His most current CD, About Time, came out in 2003 and the DVD SoundStage Presents Steve Winwood hit the stores in 2005. The Fall 2006 tour resembles the set-up on the video disc with the band line-up having been modified a bit. Joining Winwood onstage at this show was guitarist Jose Neto, percussionist Karl Vanden Bossche, plus two new band mates, Paul Booth on sax/flute and Richard Bailey on drums. With a new band on hand Winwood kicked off the show with two of the first three numbers coming from his latest record. "Different Light" and "Walking On" bracketed Winwood's first nod to the past that was a crowd-pleasing performance of supergroup Blind Faith's "Can't Find My Way Home". "It's good to be here in a nice old historic theatre, with some nice old historic musicians," Winwood kidded as he greeted the sold-out crowd early in the show. For the rest of the evening Steve was content with letting his music do the talking - speaking again only to introduce the rest of the performers. The night was filled with nods to the band and appreciative gestures to the audience that let you know Winwood was enjoying himself and his surroundings. 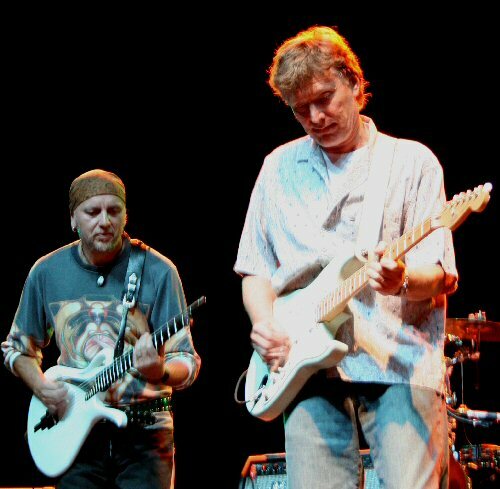 Steve Winwood and guitarist Jose Neto onstage in Red Bank, New Jersey! Winwood's touring outfit is a competent and talented 5-piece featuring the saxophone and flute work of the youthful Paul Booth as the focal centerpiece with Winwood stage right behind the B-3 most of the time. Providing guitar accompaniment was the explosive and gifted Jose Neto who's fretwork was at times otherworldly. Together, the players offered an evening's worth of extended and extensive musical forays that would fit right in with today's jam band craze. The next four songs included the new "Why Can't We Live Together", a track filled with observations on the state of the world and a plea for all of us to just get along. This block of music would also signify that this show would become a Traffic fan's dream come true. The rarely prescribed "Medicated Goo" started off the block and led into a lively version of "Light Up Or Leave Me Alone" that saw Booth really light it up on sax while supplying backing vocals as well. The song ended with a tight riff of the song's recognizable hook on both guitar and saxophone. This was followed by an unexpected near 20-minute version of "Rainmaker" - both of these tunes were from 1971's The Low Spark of High Heeled Boys album. "Rainmaker" started off with the flute and closed with a sax-ually drenching climax that was musically satisfying with more still to come. The members of the audience were digging the concert, dancing and swaying in their seats, and moving to the many extended groove filled jams. When the Traffic songs were completed, appreciative standing ovations followed. The next two tracks got another vocal segment of the audience going. The familiar strains of "Higher Love" and the mandolin-infused "Back In The High Life" had people up and dancing near the stage and that's where the wedding metaphor ends. At three or four times during the concert several women approached the stage, acknowledged Steve, and began moving to the rhythm, and during all of these instances, venue security promptly addressed them and asked the patrons to return to their seats. But, it was clear that Winwood was pleasing the two factions of his fan base on this night. One section of the audience seamed enraptured and entranced by the classic Traffic material, but the loudest acknowledgement came from the segment of the crowd that knows him best from his radio and video hits. That's a nice conflict for Winwood to have, however, on this tour and on this night, the overall set list was probably more loved by his fans from the 60's and 70's. The Traffic fantasy continued with the two songs that closed the set. "Dear Mr. Fantasy" began as a 3-piece with Winwood center stage on a Fender strat providing the familiar melody and the fast driving licks that make up this mysterious rock classic. The equally curious "The Low Spark Of High-Heeled Boys" was a timeless musical adventure that exceeded 20 minutes and had the crowd clapping along in the mid-section. The high moment had to be Neto's forearm powered hyper fast movement up and down the neck on guitar while using a unique flat-palm scratch technique. At the conclusion of the song the main portion of the show had ended as well. 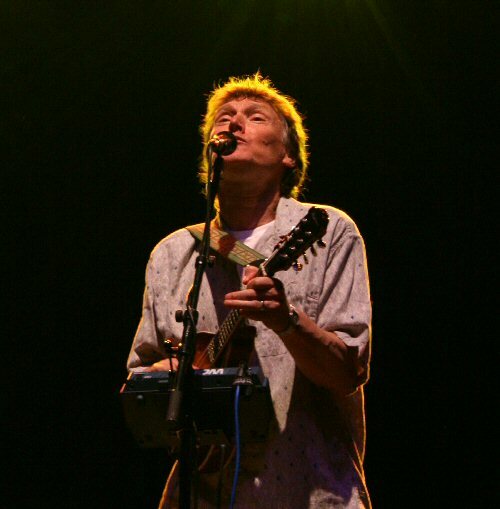 Steve Winwood has been a member of the Spencer Davis Group, Blind Faith and Traffic! 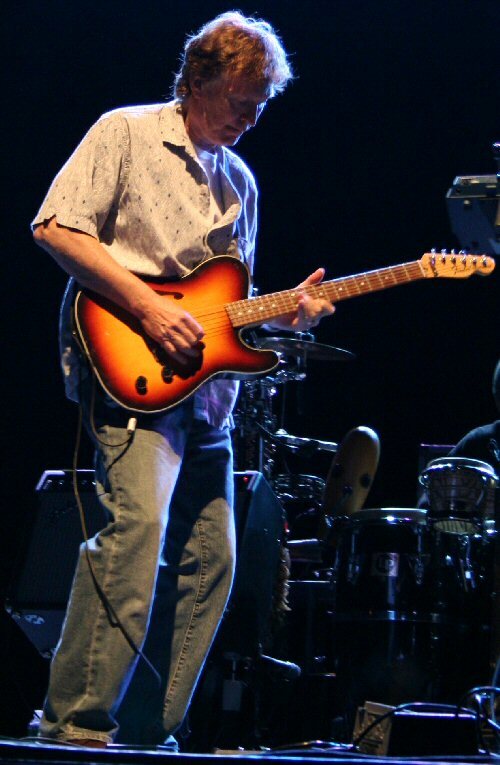 The encore included the borrowed blues classic, "Crossroads", arguably made most famous by his fellow Englishman, Blind Faith band mate, and friend - Eric Clapton. And for the show closer Winwood went as far back in his career as he could, offering a bubbly version of the classic "Gimme Some Lovin'" from his days in the Spencer Davis Group. Both these songs had the crowd up and dancing and this time security could do nothing about it. Happy fans packed it in three rows deep in front of the stage to groove and move with the band in celebratory fashion. Having watched the Soundstage DVD and attended this concert I agree with fans who say the DVD lacked a certain something. The taped performances were almost archival and sterile in their presentation or maybe it was the overly polite audience who were low on energy. All I can say is that band onstage in Red Bank was extremely loose and relaxed, imaginative in their musical forays, while feeding off the excitement coming from the gathered spectators. This is not to say the DVD wasn't good. I just mean the live concert and the packaged product were two very different animals. Besides the abundance of Traffic material the most surprising aspect of the show had to be the lack of songs from his first two breakthrough solo records from the 1980's - Arc Of a Diver and Talking Back to The Night. But, maybe Winwood was just following another age-old adage. The abscence of material from the two classic solo records, plus the spirited and energetic performance by this version of his touring unit, clearly left fans wanting more. Fans needing more from Winwood won't have to wait to long. Word has it that a new solo record will be released in mid- to late-2007 and fans can find Steve appearing on the Christina Aguilera track "Makes Me Wanna Pray," which includes a snippet of the classic Traffic track "Glad". Like I said, this was a great concert, and I'm so glad to have made it there! Steve Winwood was behind the Hammond B3 for more than half the show!